Sweet Christmas! 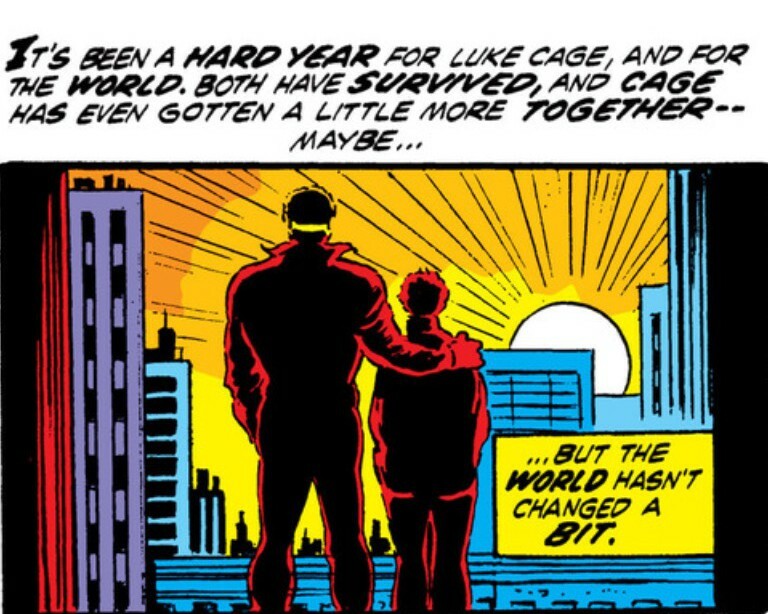 Can Luke Cage Save Us from Jingle Bombs? Maybe there really is a war on Christmas! Slay bells ring – are you listening? Remakes of Charles Dickens’ “A Christmas Carol” are more common than mutants this time of year. Even “Sanford and Son” and “The Jetsons” retold the tale. But few have told the tale focusing on Scrooge’s damned business partner Jacob Marley. 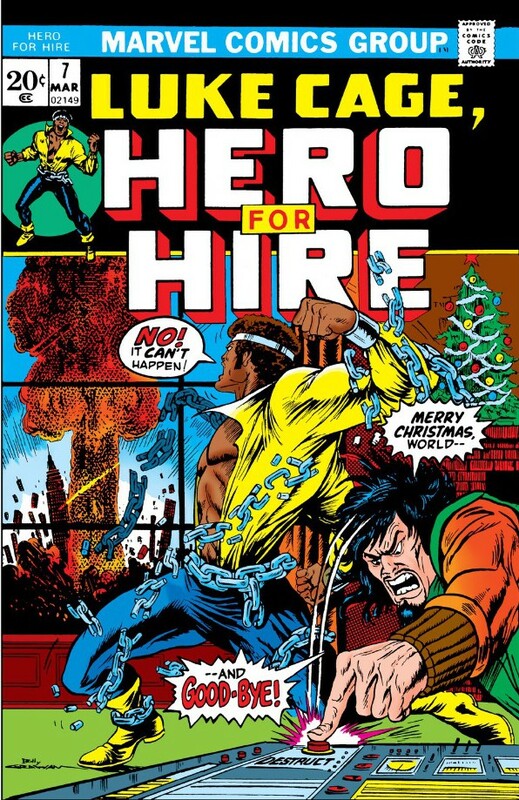 Luke Cage, hero for hire, finds himself trapped in a Dickensian nightmare right on Christmas Eve – can he convince a madman not to blow up the world? It’s a Steve Englehart tale – so expect something a tad grittier than a Hallmark card! 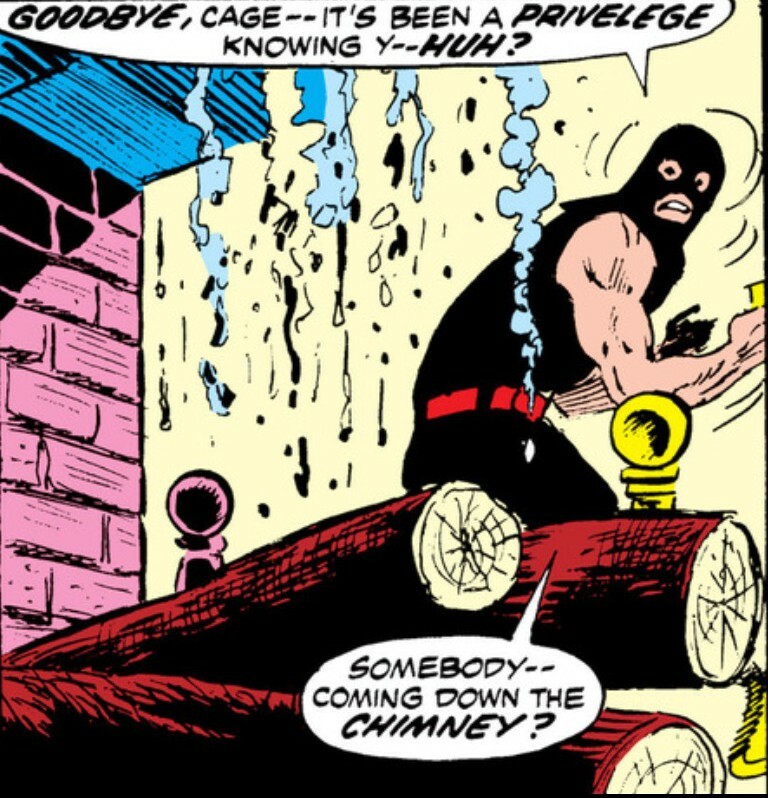 In “Jingle Bombs,” in “Luke Cage, Hero for Hire” No. 7, cover date March 1973, our street gladiator just wants to enjoy a holiday night out with his beautiful girlfriend Dr. Claire Temple. They keep getting interrupted by weirdness in the neighborhood. 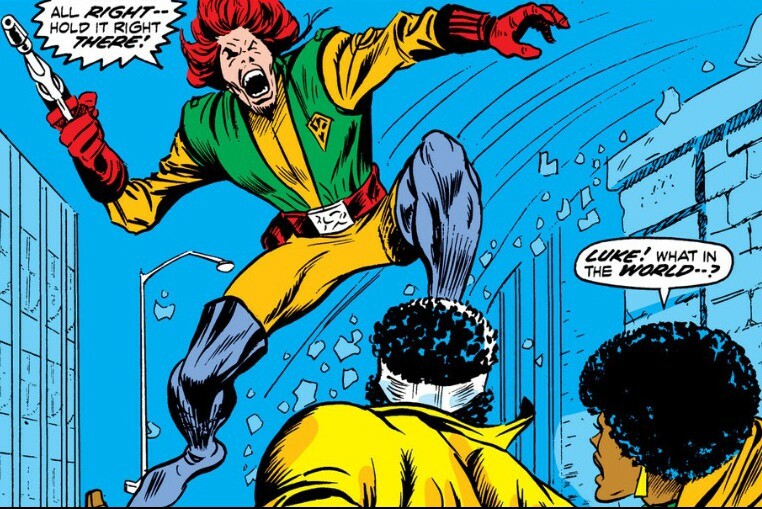 Luke Cage believes in sparing the child and beating the rabble. Luke finds a man beating a kid who is selling newspapers. The guy claims the boy deserves a thrashing because he dared charge him fifteen cents – and he’s only used to paying two! Luke saves the boy, but the assailant – Marley – is intrigued. On this special night, he’s looking for proof of human kindness – so he will test Luke again. If he is worthy, he will spare the world. Not long after, Luke and Claire encounter a homeless Vietnam veteran who goes from sympathetic and psycho in a blink. Luke handles that threat with concern for the vet’s well-being. Apparently, we will all dress like Killraven in 1984. Finally, Luke encounters a guy claiming to be from the future – all the way from 1984! – who demands his identification card and then shoots a laser gun at him. – Luke will convince the holiday fruitcake that humanity deserves to live. Marley decides Luke has proven himself worthy all right. Humanity? Oh, that so needs to go. After all that, he’s still going to drop an A-bomb on Manhattan. There’s a long expository scene explaining how he got an A-bomb, but seriously, who cares? He’s a Marvel villain, threatening with the usual bombast to end the world. We’ll take his word. – Santa Claus to save the day? No! It’s a burglar there to rob the place! But he gives Luke a distraction long enough to free himself and to save the city. Yeah, and that and some Lexapro will put you in a holiday spirit. But the bittersweet note captures the ’70s something perfect. Christmas in the city – still standing.